An aerial view shows a chemical plant after an explosion in Yancheng in China’s eastern Jiangsu province, on March 23. Police have detained six more suspects linked to a chemical plant blast in eastern China last month which killed 78 and left hundreds injured, officials said. The explosion in Jiangsu province’s Yancheng city last month was one of the worst industrial accidents in the country and led to the closure of the plant. 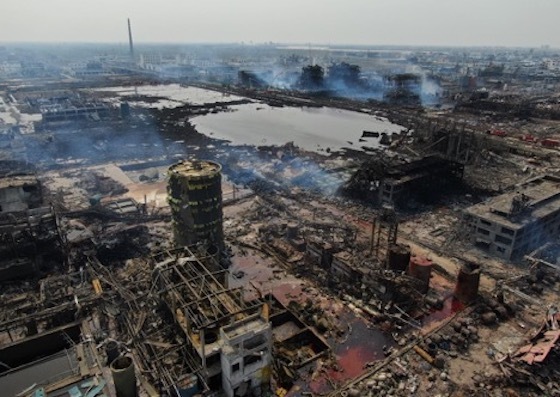 Six employees from the Jiangsu Tianjiayi Chemical company, whose plant was involved in the blast, have “major responsibilities” in relation to the incident, the Yancheng government said on Saturday. It said that “criminal coercive measures” have been taken against them –which indicates detention, arrest or being put under temporary house arrest until police complete investigations, according to an explanation on the Chinese parliament’s website. The statement added measures will also be taken against Jiangsu Tianjiayi Chemical, as well as its controlling shareholder, the Jiangsu Nijiaxiang Group.